In 2016 Jerry Wong finished eighth out of 6,737 entries in the World Series of Poker main event. In early 2017 he showed that he can still navigate a massive field when he took down the WPTDeepStacks Seminole Hard Rock Lucky Hearts Poker Open ultimate re-entry event. The $360 buy-in tournament drew an incredible field of 4,576 entries. the second largest tournament field in Florida history, to demolish the $500,000 guarantee and create a $1,426,800 prize pool. In the end Wong made a deal when play got down to four-handed action that secured him the title and a first-place payout of $250,000. At that point he held 42 of the 66 million chips in play, or just slightly under two-thirds. The next largest stack had only 9 million. “Everyone did what was in their best financial interest, and we reached a deal,” Wong said after it was all over. Wong took home just more than $1.1 million last Fall when he made the November Nine, ultimately finishing in eighth place. That was his largest live tournament score. “I didn’t win that one, but it feels good to win this one. I played with some pretty tough players and had a nice run of cards, especially after the dinner break," said Wong. 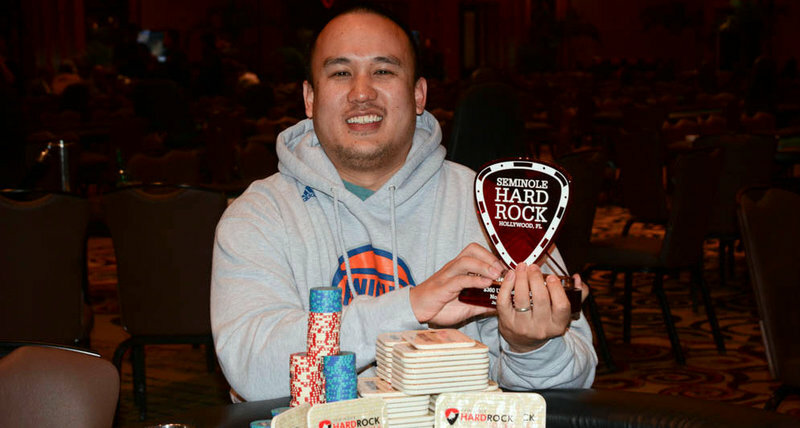 In addition to the money and the title, Wong also earned 528 Card Player Player of the Year points. As a result he climbed into 18th place in the POY race, which is sponsored by the Commerce Hotel & Casino for 2017.